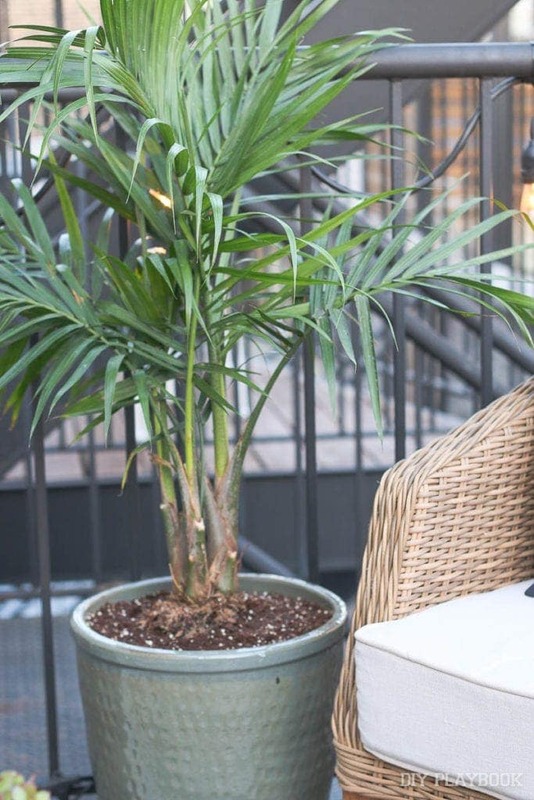 Not only are we excited to share a few mini updates from each of our patios, but we are even more excited to check out the inspiring backyards of this talented group of bloggers. 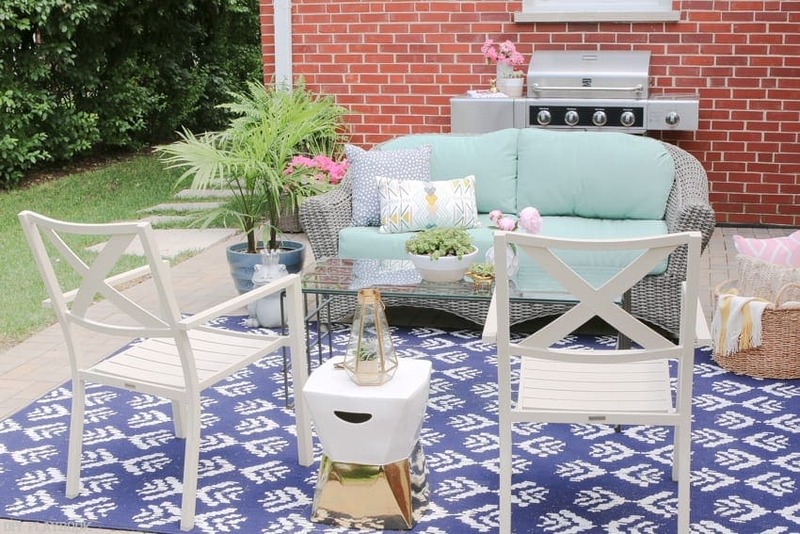 A new outdoor space will be revealed everyday for the next 2 weeks…so definitely check out Stefanie’s blog so you don’t miss a single beautiful backyard. 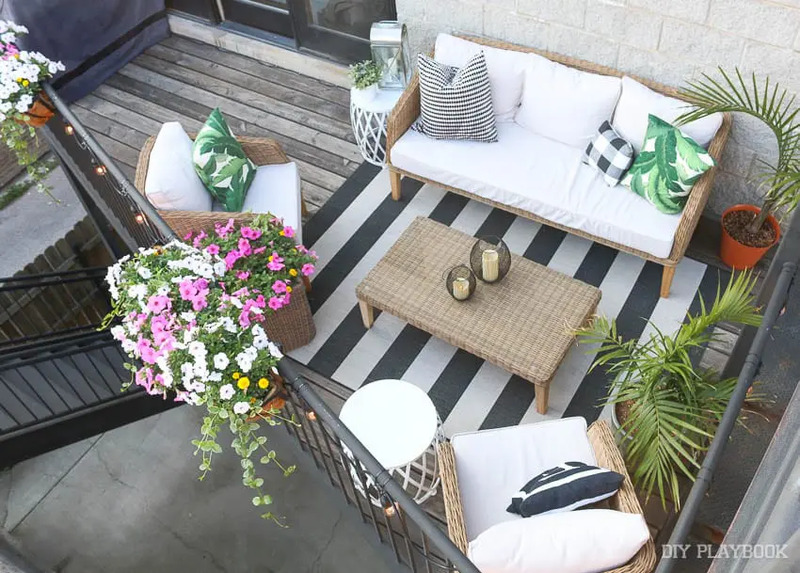 We’re pretty sure most of you already know the details about Casey’s balcony and Bridget’s patio, but for all of the newbie DIY Playbookers tuning in, here’s a mini review of what we’ve done so far in each of our “backyards”. 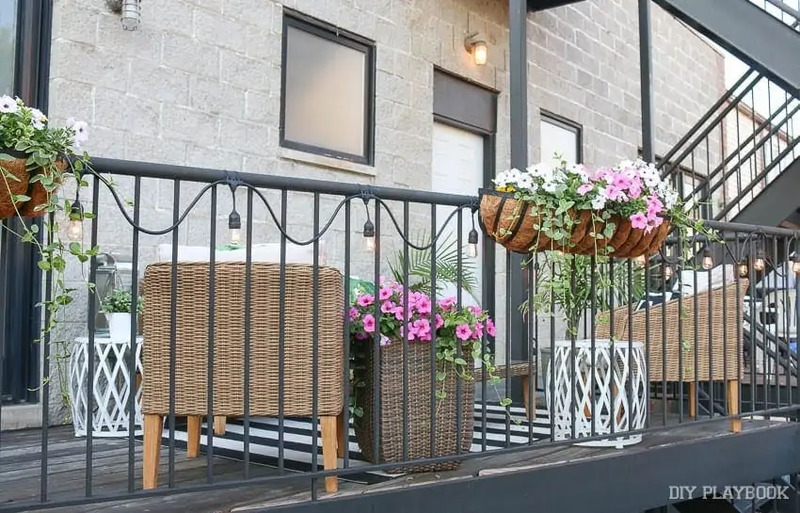 Casey’s city balcony was pretty “blah” when she moved in last October, and she didn’t put much love into it until late spring when she revealed her gorgeous new patio furniture! Because it’s kind of shaped like a triangle, the space was a little tricky to figure out. But after she enlisted the math mind of Mr. Finn and did lots of research (in true Casey fashion), her balcony is more gorgeous than ever! 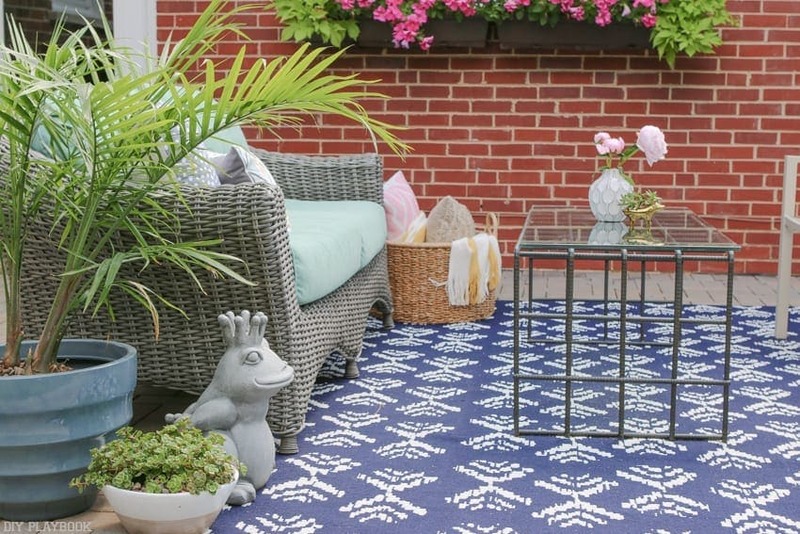 Bridget’s patio was non-existent when she moved into her house. It was a mess of dirt, weeds, rocks, and tree roots. What is now a door leading out to this space, used to be just a window. 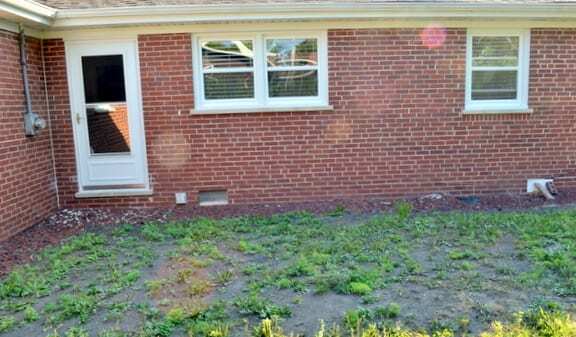 She had the door cut in and hired a landscaping crew to put in an extensive drainage system around her property… which resulted in having zero grass for months. Little by little the grass seeds grew, the patio was laid, flowers were planted and this non-existent space is now a spacious patio. 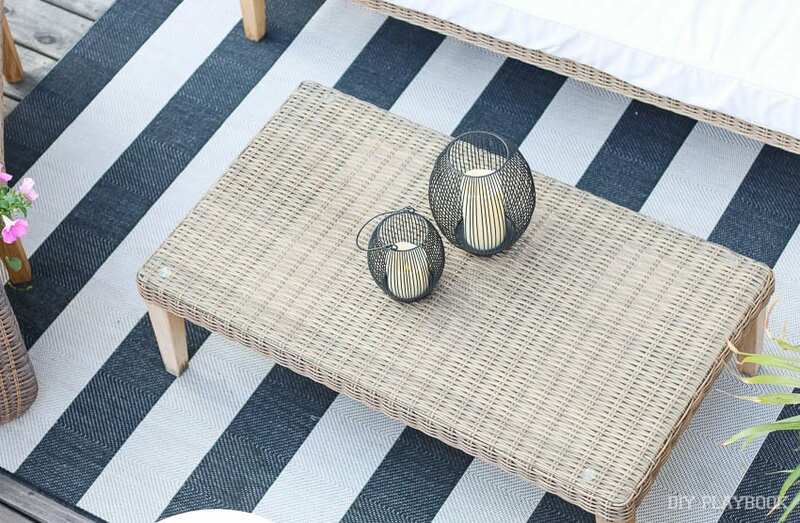 Now that we’re all on the same page, let’s take a look at how these spaces are looking today. 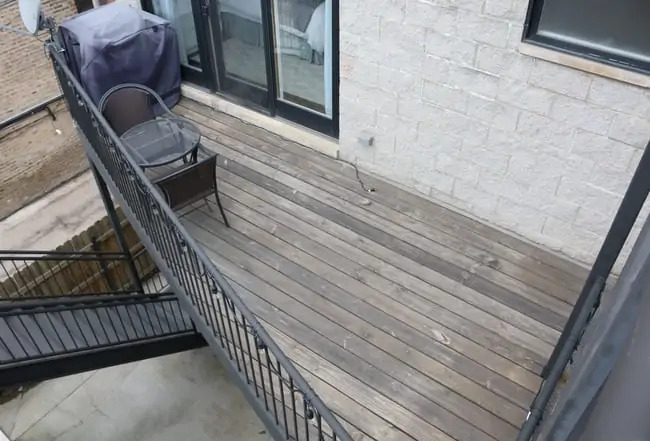 As you can see, our patio has come a loooong way since we moved into our city condo. 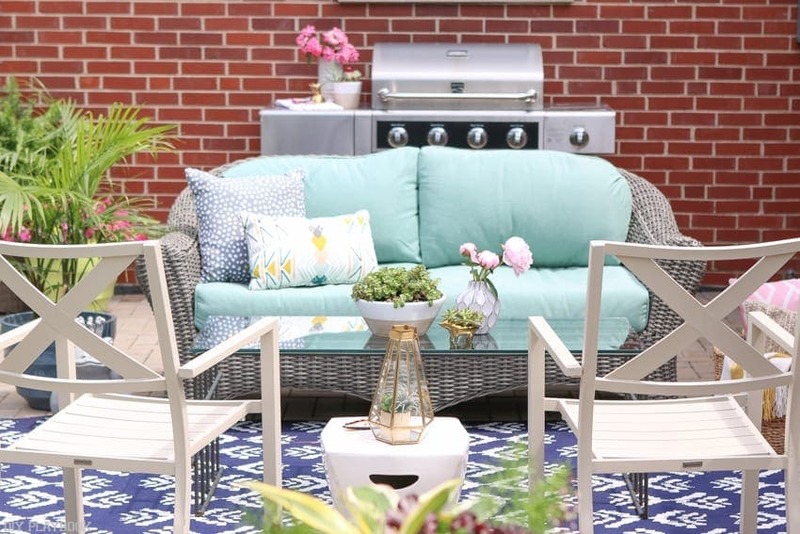 What was once bare and boring, is now full of life and makes for a great outdoor living space! The last time we chatted about this space, we had yet to plant any flowers. At the end of May, the Director of Botany (my husband’s self-proclaimed title) added 2 flower boxes and a big flower planter to this space. While I had full faith in his gardening abilities, I am blown away by how lush, green, and ALIVE our flowers still are 2 months later! 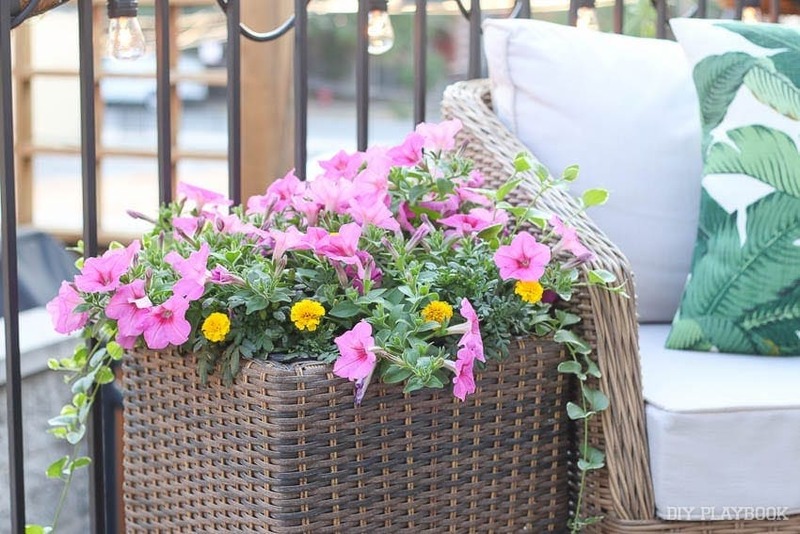 They’re blooming and make our patio space that much more cozy and inviting. Since we live in a building with 4 other units, I love how the plants and flowers provide a little extra privacy. Not that we don’t heart our neighbors (they’re all actually awesome! ), but it’s nice to have a little privacy when you’re outside enjoying a summer night. Because outdoor space is such a premium in a big city like Chicago, we are very grateful for our little slice of the great outdoors. That’s why you’ll most likely find us out here on weekends grilling, playing games, and just soaking up these warm summer days. 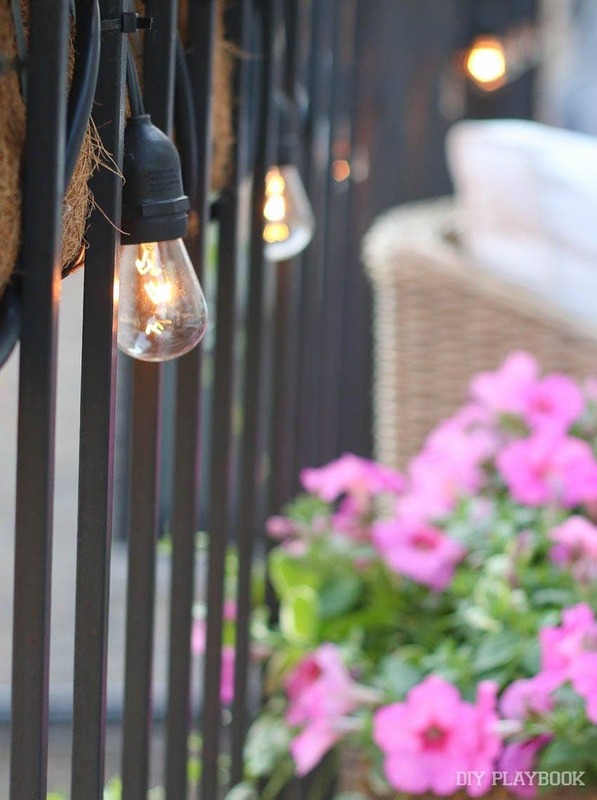 Lanterns, candles, and our patio string lights really illuminate this space when the sun goes down, and that’s my favorite time to come out here to relax. There’s just something so peaceful about sitting outside with the sounds of the city and summer all around you. Plus a cocktail in hand doesn’t hurt either! From no patio at all, to this colorful outdoor retreat has been quite the journey over the past three years. 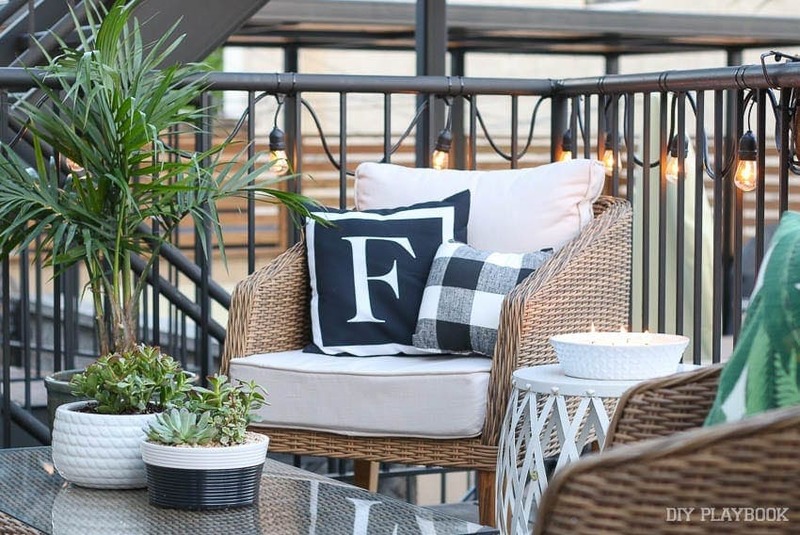 Every summer I feel like our patio becomes home to more and more outdoor memories. We love having family and friends over (although we don’t do it nearly as often as we should!) 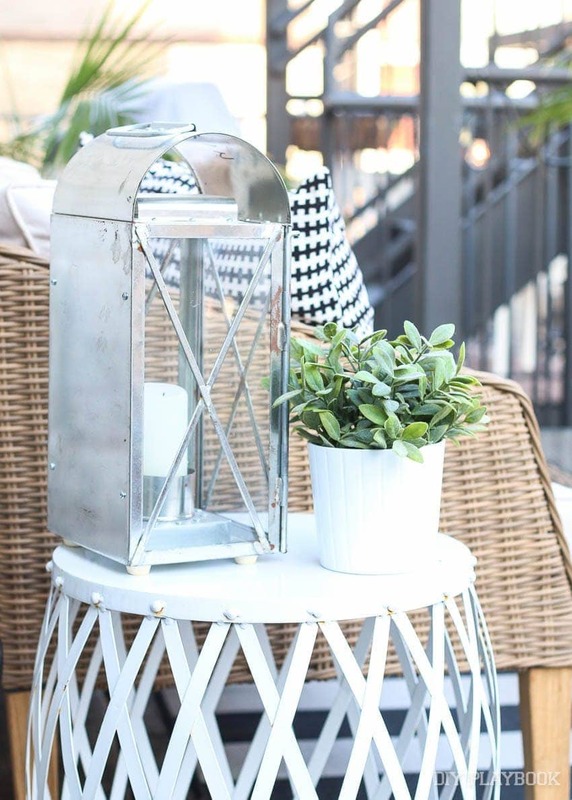 to BBQ and enjoy the gorgeous summer nights. I try to fill this space with as many plants as I can… the more color and vegetation the better! 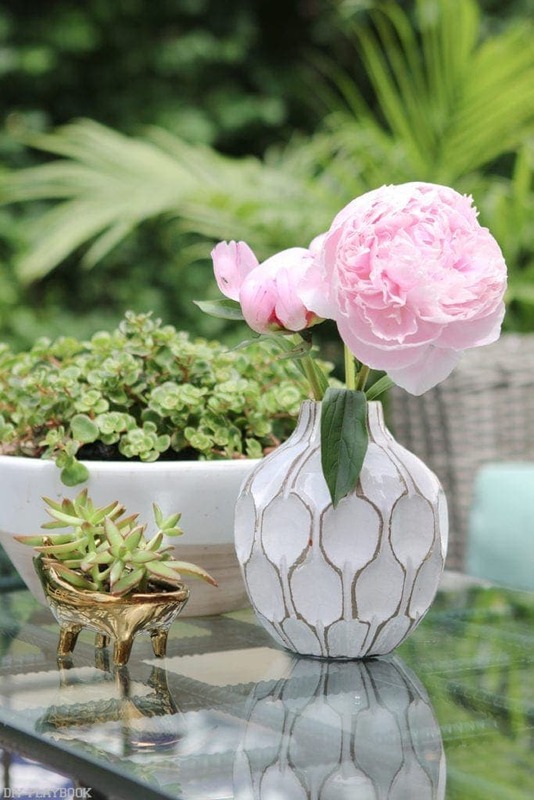 Outside of the plants, I add a few simple accessories to make this space feel personal & more like an outdoor room. 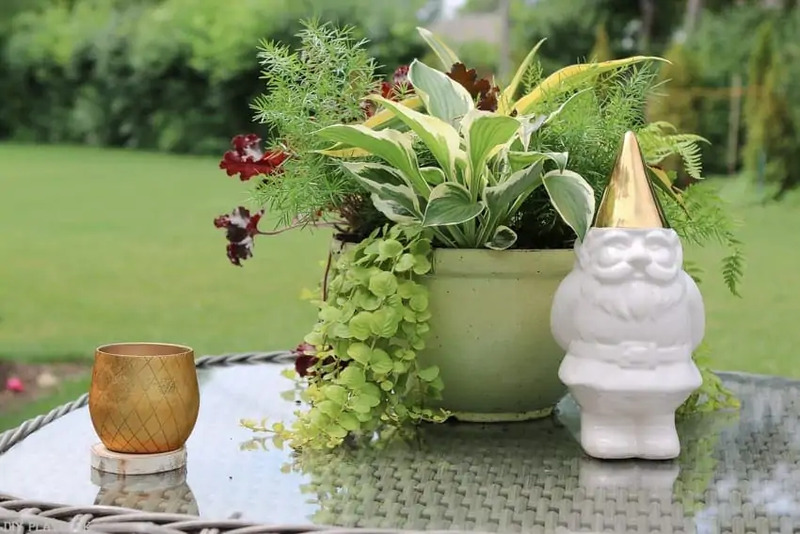 I choose items that can easily stay outside for the summer and don’t need much maintenance (like this quirky yet adorable garden gnome). <— His name is Norm if you’re wondering. 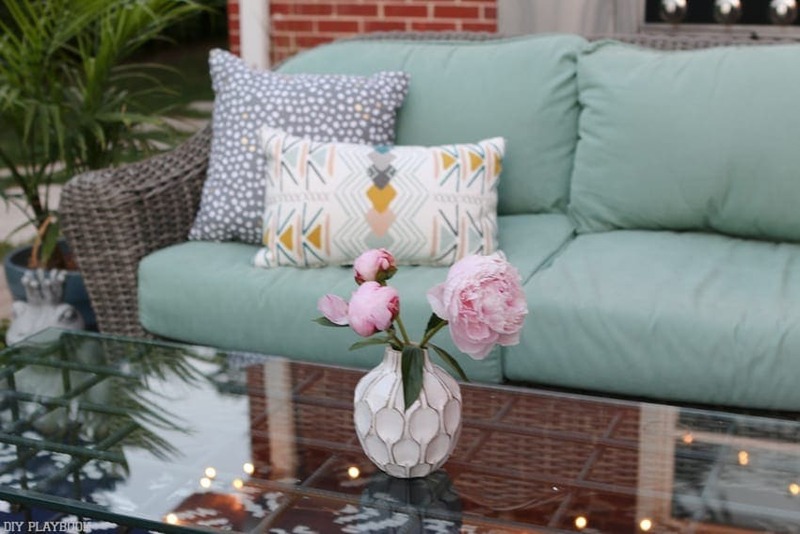 We leave the furniture out all spring, summer and fall, but don’t leave the pillows or cushions out if the forecast suggests rain. 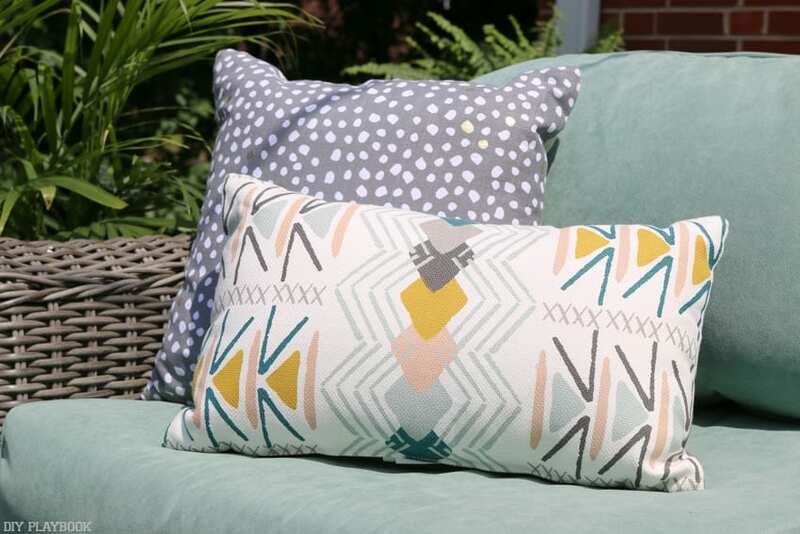 Since it’s outdoor fabric, we technically can leave everything outside, but keeping the cushions and pillows in the garage during rainy days has really helped with longevity. 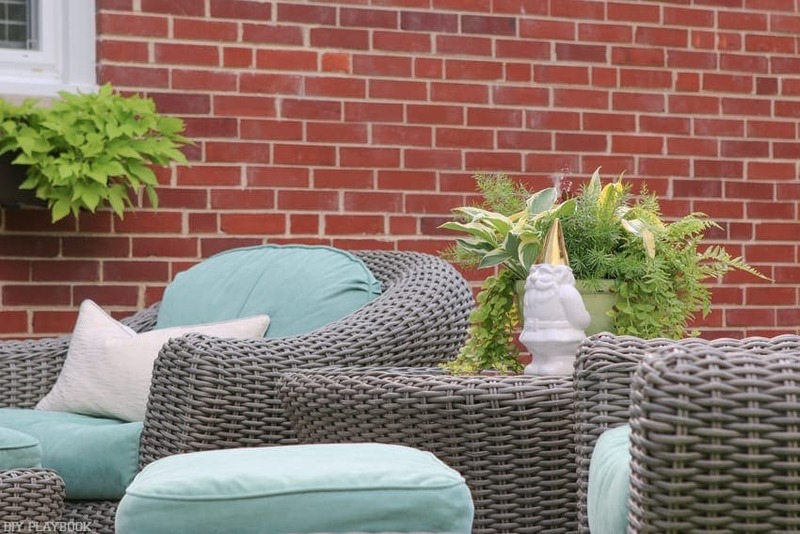 We’ve had the patio furniture for over three years and it still looks as good as new! I switch out the rug every year(ish) and usually wait until early fall to buy a new one that’s marked WAY down for the season. 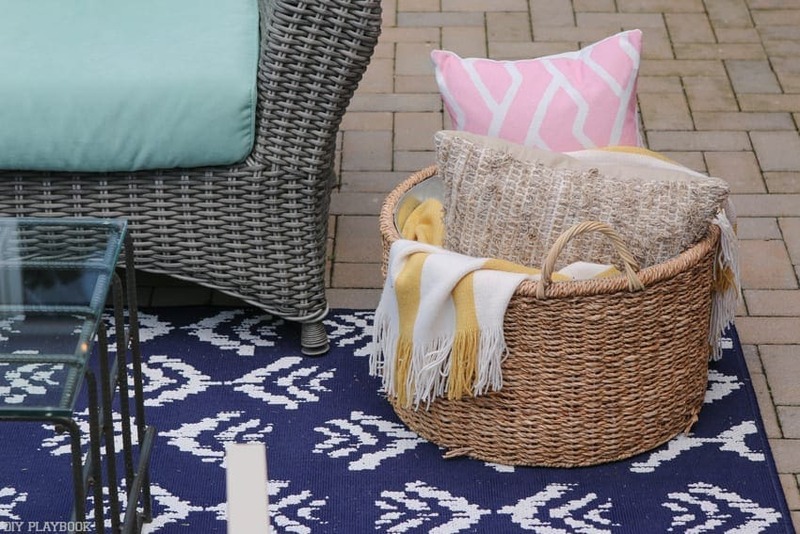 This navy 8×10 rug was a steal from Target’s clearance section last fall and has definitely brought new life to our patio this year. But as much as I loved it when I bought it, I’ve had a bit of design regret this season. I’ve learned that bold, busy rugs may be gorgeous but aren’t necessarily my style for the long run. I found out the hard way that I’m more of a neutral, light rug kinda girl. But instead of seeing this as a design fail, I’m chalking it up as a lesson learned. 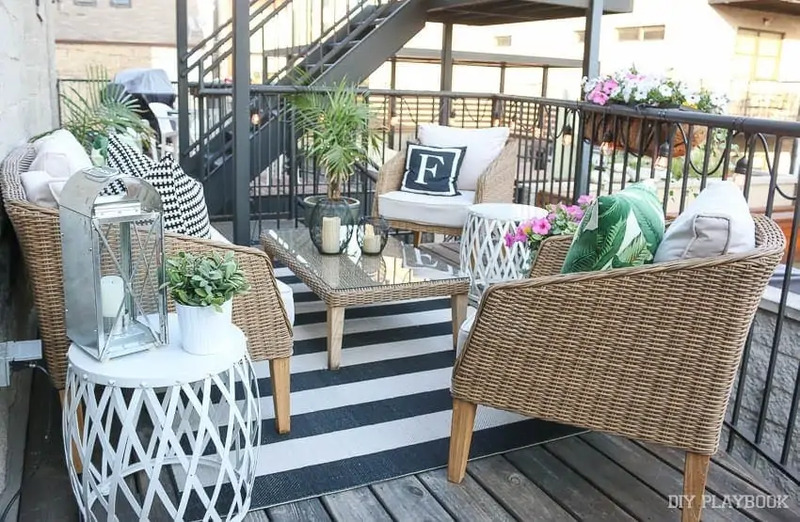 I continue to see myself being drawn toward more neutrals (especially after seeing Casey’s black and white balcony). Slowly but surely, I’m trying to bring more neutrals into this space. In the meantime, I am working hard to make the best of what I already have and embrace the color. 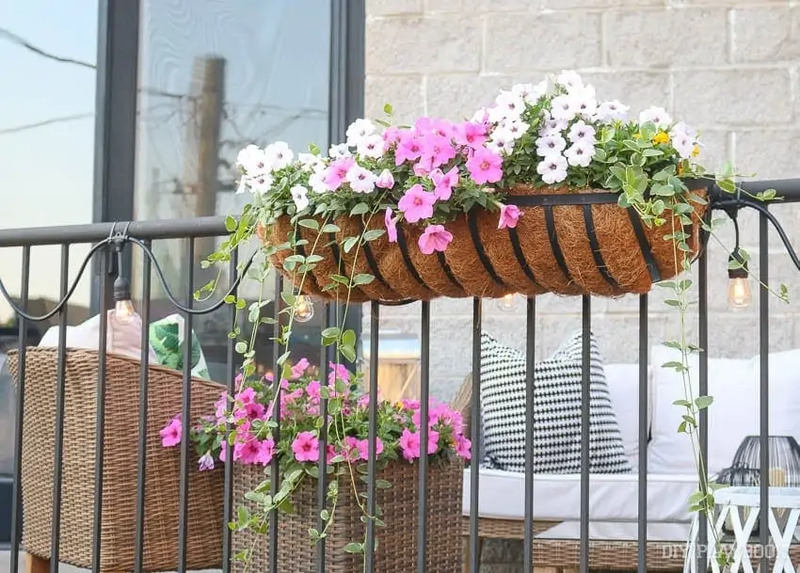 I am still in LOVE with the faux wood flower boxes I installed last year (even though drilling into the brick to install them was a doozy). That project has been well worth it in the long run. 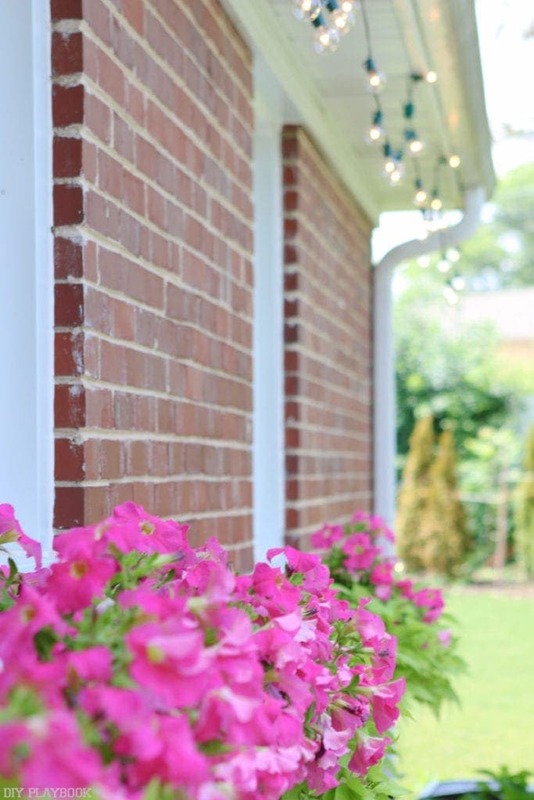 From June through September-ish, these flower boxes are exploding with gorgeous flowers. 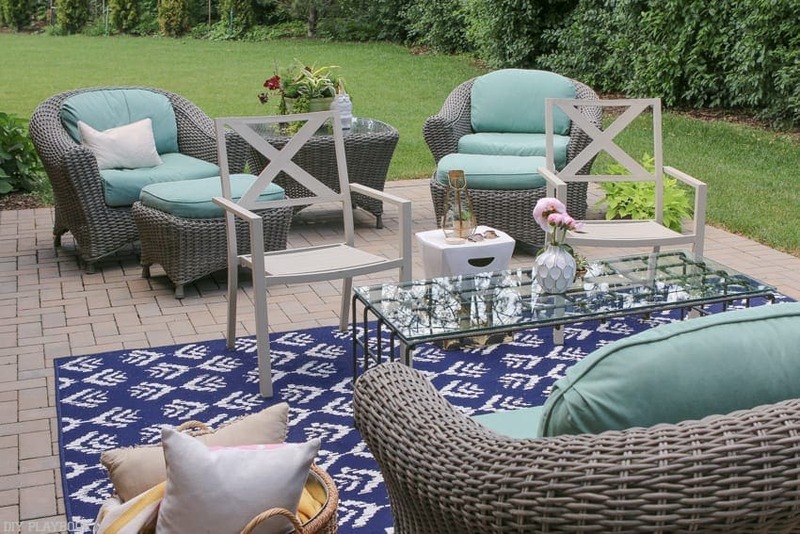 We originally bought this patio set because it’s so comfortable and offers a lot of seating. Since then, we’ve added two other cream chairs and the two-toned stool that doubles as a mini table (both last fall from Target’s super clearance section). With this set-up, we can easily seat 10 people on this furniture comfortably. <— the ottomans make for comfortable seats when we have people over. And when we aren’t entertaining, these big chairs are super comfortable to kick up your feet and relax. But to be perfectly honest, Matt and I don’t sit out here NEARLY as much as we should. When we do sit out here we look out into our backyard and reminisce about how much this space has changed since we moved in. I still have more plans for the patio/backyard, but I try to focus on what we’ve accomplished, rather than what’s still left on the to-do list. And when I do that I’m quickly reminded of how far this patio has come and how grateful I am to have this outdoor space.